With the outdoor painting season in full swing, the artists at the Wallkill River School (Montgomery, New York) are excited to present a collection of Hudson River School–style paintings. This juried exhibit of classical landscape painting will be held in honor of our predecessors, the Hudson River School. The exhibit will end with an artists’ discussion by award-winning artist and local teacher Christina Pahucki, who will give a presentation about the Hudson River School and its legacy at the exhibit’s closing event on August 25. For years, Wallkill River School artists have been painting in farm fields, open spaces, and historic sites throughout Orange County in an attempt to capture the beauty of our region. Although many people do not know, this practice of ours was inspired by the first American art movement, the Hudson River School artists. The Hudson River School was a term coined in the early 1800s to describe the romantic and luminous landscape paintings of the newly discovered Americas. These paintings gave the world their first glimpse into the Americas and have left a huge mark on the world of art. Hudson River School paintings reflected three themes of 19th-century America: discovery, exploration, and settlement. The paintings also depict the American landscape as a large, luminous setting, where human beings and nature coexist peacefully. Hudson River School landscapes are characterized by their realistic, detailed, and sometimes idealized scenes of the new world, often showing peaceful farms alongside the remaining wilderness, which was quickly vanishing from the Hudson Valley as more settlers came to the new world. As an organization with deep connections to environmental sustainability and to classical art, the Hudson River School naturally became a huge inspiration for the Wallkill River School. The exhibit will be juried by award-winning oil painter Mike Jaroszko. Of our represented artists, Jaroszko has always had a certain respect for the Hudson River School of artists. With much of his displayed work being done in the Hudson River School style, he was the perfect choice to jury this exhibit. 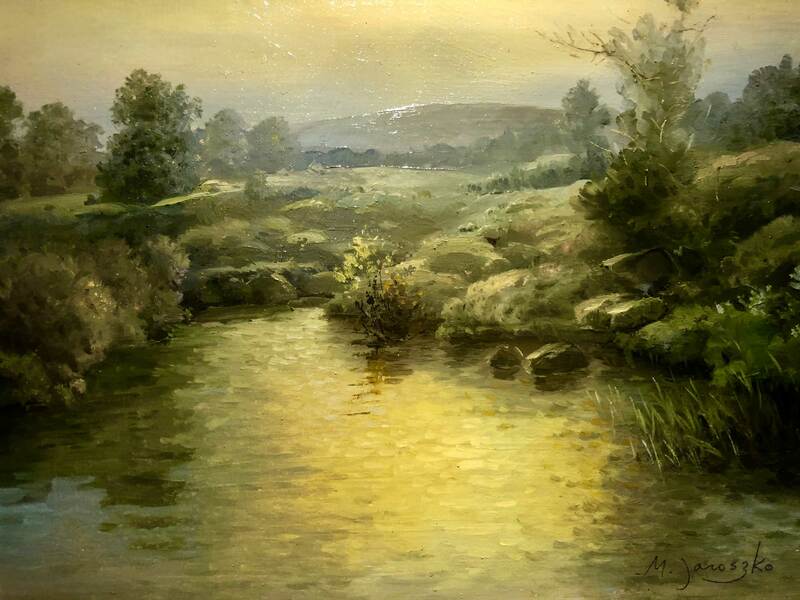 In terms of his fine art, Mike is inspired to portray the local hills and rivers with the nostalgic atmosphere of a Hudson River School artist. With intense light and color, he conveys the tranquility and beauty of nature. Recently he has been exhibiting pieces of fine art in local galleries, painting images that capture nature with all its atmosphere in a traditional style.